The 2SaveEnergy greenhouse concept consists of a combination of a ‘standard’ greenhouse covering with an ETFE-film below to provide good insulation. A double screen system with a cavity of only 5 cm has also been installed. In contrast to the optimal greenhouse covering (in terms of transmission properties) of diffuse glass with a clear film determined in a preliminary study, it was decided to use the trusted highly transparent clear glass with a diffuse F-clean film underneath. The reason for doing so was the unknown effect of condensation on the transmission through a diffuse glass. In 2015 a tomato crop was grown in the 2SaveEnergy greenhouse. The yield of the variety Cappriccia was 67 kg/m2, which was higher than the set target of 63 kg/m2 and higher than in practice. The diffuse greenhouse covering is undoubtedly responsible for some of this difference. The cultivation went smoothly in general, without any sign of Botrytis or other damage. One striking aspect was unevenness in and within the clusters in different periods. The cause of this is unclear and undoubtedly had an effect on the total production. It is unlikely that this was caused by the greenhouse concept. The savings in heating show two clear seasons throughout the year: the winter, when in particular the greenhouse covering and screen are responsible for the reduction, and the summer, when the HNT cultivation concept produces savings in energy compared to the usual practice. The low energy consumption in the summer has the disadvantage that, to achieve the target production level, an external CO2 source must definitely be available. Even with the economical dosage strategy used in this trial, over a year at least 13 kg of CO2 will have to be purchased. The availability of an alternative CO2 source is very important to realise these great savings. The dehumidification with outside air suction and reheating worked properly, and not imposing a minimum tube temperature did not lead to any evident problems (moisture). There was little snow in the winter of 2015, which meant it was not possible to test the snow-melting function involving the suction of greenhouse air to be distributed through the gutter to the cavity between the glass and film. Test measurements showed that the air in the gutter cooled off very rapidly, so the melting capacity must be low. As the cavity between the glass and film in this concept is not airtight, condensation can occur in the cavity. We do not know whether this will have any consequences for the transmission in the long term, nor what they could be. One year of growing tomatoes in the 2SaveEnergy greenhouse revealed that the use of an insulating greenhouse covering and intensive (double) screen use did not negatively affect the yield. 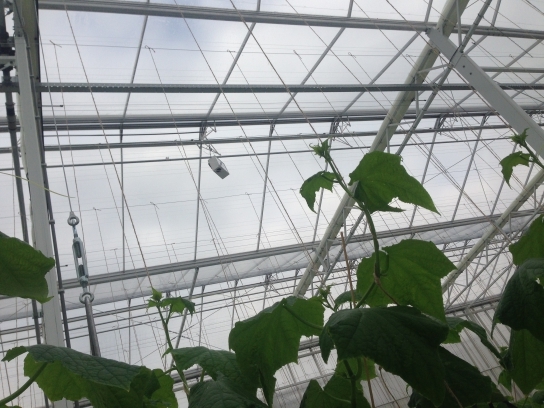 Thus, this greenhouse and cultivation concept produced a savings in heating approaching 50% compared to the standard practice. On the other hand, at least 13 kg of CO2 had to be purchased. A consortium of companies consisting of VDH Plastic Greenhouses, Van der Valk Horti Systems, AGC Chemicals Europe and Boal Systems designed and built the 2SaveEnergy greenhouse concept, having been inspired by the idea of a double-glass greenhouse with insulating glass. The research was made possible by the contribution from the Kas als Energiebron programme. This is the innovation and action programme of the Ministry of Economic Affairs and LTO Glaskracht Nederland, which is partly financed by the Stichting Programmafonds Glastuinbouw.